Western blot analysis of extracts from mouse brain, untreated (-) or phosphatase-treated (+), and rat brain using Phospho-Tau (Thr205) (E7D3E) Rabbit mAb (upper) and Tau (D1M9X) Rabbit mAb #46687 (lower). 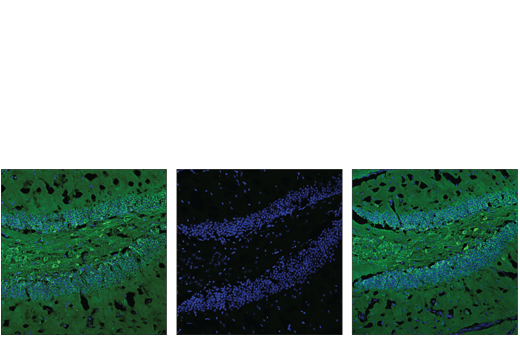 Immunoprecipitation of Phospho-Tau (Thr205) from mouse brain lysates. Lane 1 mouse brain lysate immunoprecipitation, lane 2 is Rabbit (DA1E) mAb IgG XP® Isotype Control #3900, lanes 3, 4, and 5 represent three dilutions of the immunoprecipitation of mouse brain lysates at 1:50, 1:100, 1:200 respectively, and lane 6 is mouse brain lysate. 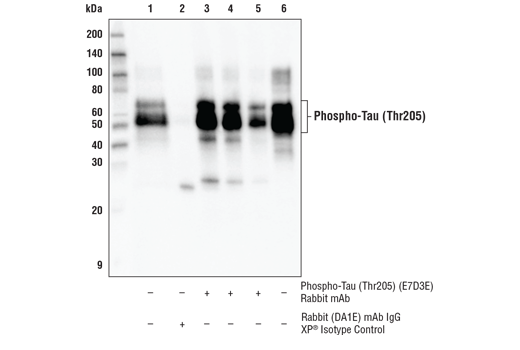 Western blot analysis was performed using Phospho-Tau (Thr205) (E7D3E) Rabbit mAb. 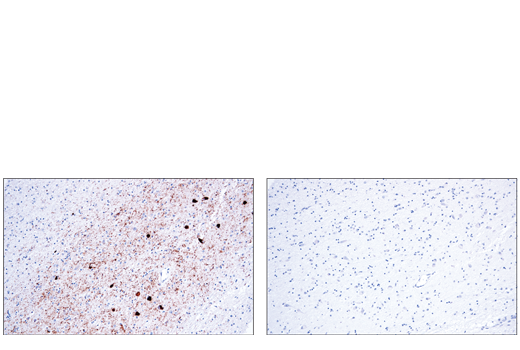 Immunohistochemical analysis of paraffin-embedded human Alzheimer's disease brain using Phospho-Tau (Thr205) (E7D3E) Rabbit mAb in the presence of non-phospho-Tau (Thr205) peptide (left) or phospho-Tau (Thr205) peptide (right). 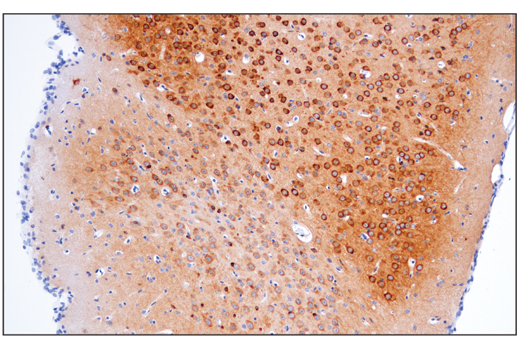 Immunohistochemical analysis of paraffin-embedded mouse brain using Phospho-Tau (Thr205) (E7D3E) Rabbit mAb. 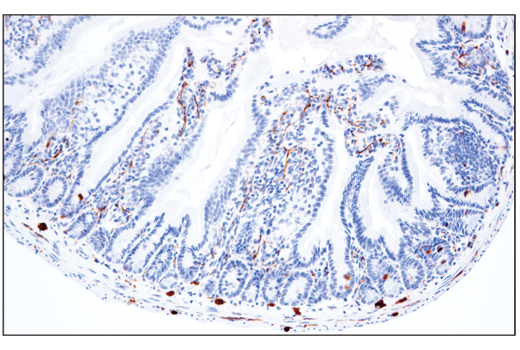 Immunohistochemical analysis of paraffin-embedded mouse small intestine using Phospho-Tau (Thr205) (E7D3E) Rabbit mAb. Confocal immunofluorescent analysis of mouse medulla oblangata using Phospho-Tau (Thr205) (E7D3E) Rabbit mAb (green). Blue = DAPI #4083 (fluorescent DNA dye). 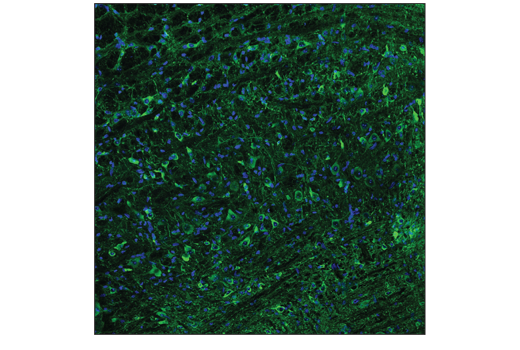 Confocal immunofluorescent analysis of dentate gyrus in wild-type mouse brain using Phospho-Tau (Thr205) (E7D3E) Rabbit mAb (green). Antibody was pre-incubated with a non-phospho-Tau peptide (left), a phospho-Tau (Thr205) peptide (center), or without peptide (right) to confirm phospho-specificity. Samples were mounted in ProLong® Gold Antifade Reagent with DAPI #8961 (blue). 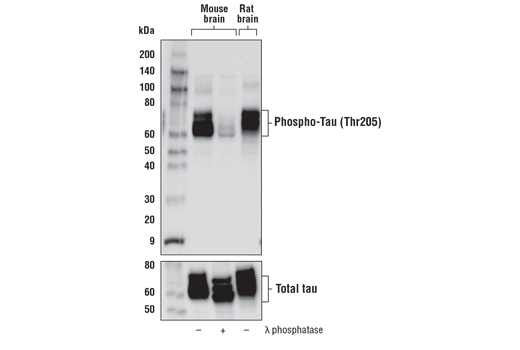 Phospho-Tau (Thr205) (E7D3E) Rabbit mAb recognizes endogenous levels of Tau protein only when phosphorylated at Thr205. Monoclonal antibody is produced by immunizing animals with a synthetic peptide corresponding to residues surrounding the Thr205 of the human Tau protein. Phosphorylation of Tau at Thr205 is found in Alzheimer's disease brain. This phosphorylation is the result of the activity of glycogene synthetase-kinase 3 (GSK-3), protein-kinase A (PKA), and other kinases (4,5). Protein phosphatases have been shown to decrease the levels of phospho-Tau at Thr205, including protein phosphatase 5 (PP5) (6). Wang, J. et al. (2000) Zhongguo Yi Xue Ke Xue Yuan Xue Bao 22, 120-3. Wang, J.Z. et al. (1998) FEBS Lett 436, 28-34. Liu, F. et al. (2005) J Biol Chem 280, 1790-6.